Friday Night Lights: "East Of Dillon"
A few more words before we get to the fourth season premiere: As we did last year, we’ll be double-posting our TV Club coverage of FNL, once when an episode airs in the fall and again when it airs next summer (!) on NBC. Also, looking back over last year’s posts, I realize I underrated the show. Maybe it was my own anxiety creeping into the writing or something. Maybe it was the weird rhythm of the season, which had to squeeze in back-to-back going away arcs while also following the football season. But, on reflection, I feel like I was a bit too hard on a season that started well, got even better, and ended on a note that felt a little curious at the time but now seems like a canny way to open up the show to new possibilities. And so, season four: “This town has been divided,” says Dillon’s ubiquitous sports radio voice over the image of Coach Taylor putting on an East Dillon cap as we ease into a graceful montage catching up with everyone as summer edges into fall. There aren’t any real surprises here. Coach faces an uphill battle at his new East Dillon home—including a raccoon. Buddy continues to be “helpful” to a Panthers team now ruled by the golf cart-riding Coach Aikman and Joe McCoy. Saracen has stuck around, and now delivers pizzas—Panther Pizza, specifically—while, we’ll learn later, taking art classes at Dillon Tech on the side. Landry’s on his way to East Dillon. And, though he’s not in the montage, Riggins has taken to academic life about as well as might be expected. Onto the new. The fourth season premiere lays out several threads, most of them connected in one way or another to Coach Taylor’s new job at East Dillon. And what a job. Coach has been given a team where Landry shines as a beacon of competence. Of course there’s more going on here: A divided town rarely gets divided evenly. The privileged have stayed on the west side and the money and resources have remained with them. That means Coach has to lure an assistant coach away from his secure job and pick up Stan (played by an actor whose name I don’t yet know), a Sears employee with a Pop Warner background who worships Coach Taylor and can’t shut up about it. And because we already know the redistricting was done in such a way to keep the football talent on the west side, Coach is left with a bunch of guys whose desire to play football outstrips their skills, when it’s clear that they’re there out of desire at all. Then there’s this: The gerrymandering hasn’t taken place cleanly along racial lines, but East Dillon has a lot more African-American students than its sister school. Race played a major role in the Buzz Bissinger book and it’s a subject the show has dealt with well in the past. Now it’s front and center, even if it’s not addressed directly. Coach Taylor treats this team as he would treat any time, but I wonder if it’s perceived that way by his new players. When he (rightly, if too forcefully) throws out a player for antagonizing Landry and refusing to apologize it makes sense that a lot of the black players would leave. 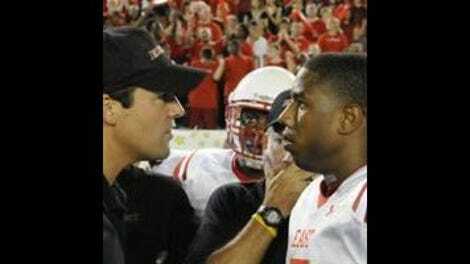 The Coach Taylor mystique hasn’t carried over across town and who wants to stick around and be yelled at by a mean, know-it-all white guy? Saracen seems tense even before the blow-up, however. He’s made the decision to stick around to stay with Julie and take care of his grandmother, but by the end of the episode it’s clear his grandmother’s faculties have continued to decline and Julie’s not speaking to him. And his dream of pursuing art isn’t going anywhere at Dillon Tech. I wasn’t quite sure how to read that scene with the art teacher. She’s offering an honest opinion of his art and while obviously, as Saracen suggests, Dillon Tech’s no Chicago Art Institute, she may not be wrong about his work thus far. But either way, she’s right about one thing: What is he doing there when he clearly needs to be somewhere else? Zach Gilford’s time on the show is limited, answering that question, but what about when you’re stuck somewhere inhospitable. Coach Taylor is undeniably a great coach, but what can he do with the resources given him? If it wasn’t clear already, the episode’s stunning final scene shows just how tough a job he has ahead of him if he even just wants to prove J.D. wrong by racking up a single “W.” The halftime scene before he forfeits the game looks like the aftermath of crime scene. Will this team even be in shape to play a game in next week’s episode? We’re entering a season where that’s not even a given, and it’s an exciting place to be. • Is Sears this season’s Applebee’s? • For all the time spent establishing where everyone is and what they’ve been up to, there were some conspicuous absences: Tyra, Lyla, and Mrs. McCoy. • NBC hasn’t updated the FNL area yet so I have no new photos. Sorry for the image above.